By definition the word flaunt means to display proudly. When you see the items in our Etsy shop, Flaunt Designs Jewelry, this week you will want to do just that! 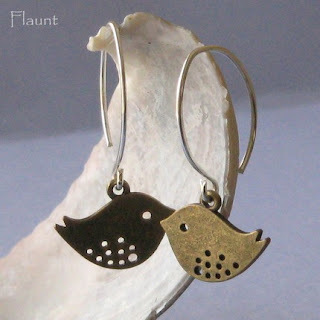 Finding inspiration from nature, art or anything that catches her eye, Lin handcrafts each piece from quality materials. Flaunt these beautiful stud earrings. Sterling silver posts, flower swings, a sparkly briolette and blue quartz drops add up to a lovely addition for your jewelry collection. Lin's nature inspiration is clearly displayed in this delicate piece. 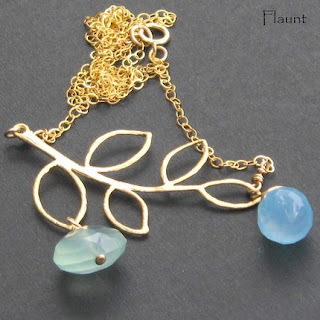 By combining 14K gold fill chain and wire wrapped blue & green gemstones this creation is so very pretty! Summer is right around the corner and what a perfect accessory this would be! 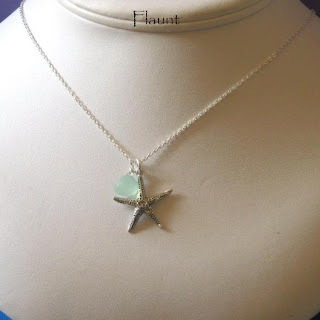 Sterling silver necklace, Peruvian chalcedony gemstone charm and starfish will remind you of the beach even if you are miles away! This week Flaunt has offered two choices for the giveaway! The winner chooses either the Twitter Love Bird Earrings in silver or brass! 1. 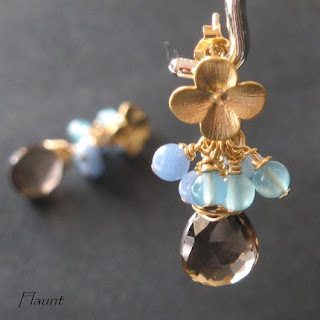 Check out Flaunt, come back here and make a comment on your favorite item. Enter by Saturday midnight and the winner will be announced on Sunday! Gorgeous and unique! My favorite is the LeFay Bracelet, such dreamy colors! Thanks for this lovely giveaway. wow. 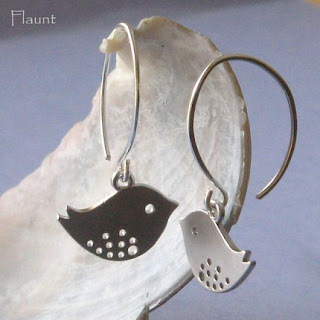 i really like the simplicity of the starfish necklace but i love love love the bird earrings!!! lovely blog! Ever since I won one of your giveaways I feel bad commenting on your "Have you seen this Etsy shop?" posts because I don't want to seem like I'm trolling for more free stuff when all I really want to do is say "oh that is so pretty! Thanks for sharing!" so consider this comment a non-entry. But everything is so pretty! I love the bird earrings and especially that golden twig necklace. That starfish necklace is right purty ma'am! I'm always looking for gift ideas... and mother's day is right around the corner now. the saturn rng necklace is super pretty! I love that starfish necklace and the first pair of earrings you posted. I'll have to check out this etsy shop when my shopping ban is over. Kelly-I would never think that! :) It is all of you that come back every week that make the feature successful! Someone twisted my arm and I bought the starfish necklace for my Mom for Mother's Day. :) thanks for the lead! Intense Guy-That was a great choice! I know your mom will love it! Thanks so much for supporting the feature!